When Welshman Chris Davies arrived in Portugal from the UK as a 17 year old in 1992, it was supposed to be for a week’s vacation. More than 25 years later, he’s still here. “I spent my first year partying and going to the beach, but then I ran out of money so I came to the coast to see what I could do,” he says. As an electrical engineer, Chris soon spotted a niche installing satellite TV systems. He built up a healthy customer base, and as in-home technology advanced, the focus of his business CPD Sound & Vision shifted—first to flat screens, then on to integrated audio systems. “Nowadays, everyone wants smart home technology—which was a natural progression for us,” he says. Eleven years ago, Chris bought a villa in one of the country’s most desirable locations, Fonte Santa. This beautiful, rustic village—set in a pine forest by the Atlantic coast—lies within the Algarve region’s exclusive Golden Triangle, an area replete with landscaped luxury resorts, golf courses, tennis clubs, marinas, sun-kissed beaches, and lush, natural beauty spots. “I was very lucky to get it on my budget, because this has always been a desirable area, but back then the villa was already 20 years old and a bit tired: single-glazed and no pool,” he says. Eighteen months after moving in with his wife and daughter, Chris gave the villa a minor makeover and installed an impressive 12 m × 5 m pool. But by 2016 he was itching to transform the family home into something more akin to the state-of-the-art, luxury properties he was routinely kitting out for his customers. “We do around 25 installations a year, mostly high-end properties in the Golden Triangle, although we’ve also worked on luxury yachts and a couple of vast properties on Lake Geneva in Switzerland. I knew exactly what I wanted, and as a Control4 Smart Home Professional, I was confident I could create the most modern and impressive smart home possible,” he says. But he had to switch on all his powers of persuasion to convince his German wife, Rita—a self-confessed technophobe—it would be a worthwhile project. “I promised to deliver the most user-friendly system anybody would ever experience,” he says. Chris spent a year designing the rebuild and smart tech installation. “We planned everything in meticulous detail—building work, interior design, landscaping, right down to the perimeter walls surrounding the property. I wanted to complete it all in eight weeks, so I brought the various tradespeople together and project-managed the whole thing like a military operation. No one working on it had ever seen such an intensive project,” he says. The remodeled villa is a spacious (1,700 m2), single-story property, with lounge, dining room, kitchen, office, and four bedrooms with ensuite bathrooms. “I designed the structural rebuild myself and planned the extension. The aim was to modernize the villa and create the optimum smart home for easy living, both inside and out. We extended by about 20%, put on a new roof, doors, windows, and added the office and new ensuites, as well as redoing the plumbing and electricity,” says Chris. He also had firm ideas about decor, although he did bring in an interior designer. “I had a big bee in my bonnet about the Norwegian smoked oak floor dictating the rest of the color scheme. I wanted to bring in some oranges and aquas, since gray throughout would have been too bland. In the end, the designer persuaded me to go a little bit on the walls that I might have otherwise,” he says. He adds that he’s tried to keep things fairly minimalist, with the odd quirky touch provided by artworks and ornaments. “My wife would probably put more stuff up if it wasn’t for me,” he admits. Two of the bathrooms feature fairly traditional decor, with mosaic stone tiles, while the one in his daughter’s bedroom has a more modern, dark gray stone effect. “We also put in giant, half-glass, floor-to-ceiling showers in two of the three principal ensuites, which makes it really easy when you come in from the pool or beach,” says Chris. He paid particular attention to the outside space, where the family frequently spends time and entertains friends—the garden, covered terrace, barbecue, and poolside areas. “When I landscaped the garden, I thought about the placement of the trees and plants in terms of creating the perfect lighting scene in tandem with the Control4 system,” says Chris. Sculpted cloud pines and palm trees dapple the space, while an impressive spray of cerise bougainvillea overhangs the arches on the pool side of the villa. “When the lighting scenes come on at night, everyone says it absolutely transforms the place—it feels like you’re in a luxury resort in Mauritius,” he says. As for the technology, apart from some simple control screens and keypads, you’d never know it was there, despite the fact it took 7 km of cabling and 6 km of tubing. “I put in false ceilings throughout and plaster-boarded all the walls. As well as hiding the technology, it gives us excellent insulation,” says Chris. “I also built a new office and new entrance. The office houses all the technical kit, and beside the new entrance I’ve built a big cupboard, which hides the fuse board for the Control4 modules,” explains Chris. My wife was happy as it meant I got a new office and she got a huge shoe and coat cupboard,” says Chris. The technology may be invisible, but it is incredibly powerful. Using simple controls on an in-wall touch screen, keypad, or smartphone app, the family can control pretty much every aspect of their environment with ease—including home entertainment, security, lighting, curtains, air conditioning, and heating. It can also all be controlled via smartphone when they’re away or set to pre-defined schedules. “There is always music playing somewhere, mostly the kitchen—the hub of the house. My wife previously used the original Sonos system, and didn’t want anything more complicated, so I made it even easier for her by putting a keypad in the kitchen just for her music and volume control—one touch of a button and no scrabbling ‘round to find a remote. Meanwhile, my 21-year-old daughter Nianina, who recently graduated from University in the UK and returned to Portugal for the summer, loved the ease and flexibility of flicking between video sources, selecting music, using Airplay to stream content from her phone, having a touch screen in the bathroom, and so on. Heated mirrors fight off the fog caused by steam and provide extra warmth in the bathroom. Automated security controls have also been a major boon for the family. The main house and the perimeter border have separate alarms. “Because it’s such a spread- out property, if I was on one side I wouldn’t have a clue what was happening on the other. Now we can stick on the perimeter alarm at the touch of a button and feel perfectly safe leaving all the doors and windows open. There’s also a door intercom and automated gates which can again all be controlled remotely using the Control4 system—even when the family are away. “We travel quite a bit, and now if the maid, pool man, or gardener rings the bell, I’m instantly notified on my phone wherever I am and can turn off the alarm and open the gates to let them in,” says Chris. “I also set schedules for the lights, shutters, and curtains when we’re away. And when we’re coming back, we can switch on the air conditioning or hot water to be ready for our return,” he adds. Just as he promised Rita, he’s made everything as simple as possible. As well as the easy, flexible entertainment controls and pre-set lighting scenes and schedules, when leaving or returning to the villa each family member can enable/ disable the alarms and lock/unlock the gates in the correct order simply by tapping in their own code. In addition, a single press of the “Good Night” button will completely close down the house for the night, turn everything off, and set the perimeter alarm, while the “Good Morning” button wakes everything up. And while he admits the smart tech bumped up the cost of the rebuild, it also enabled Chris to optimize energy efficiency. “The lighting’s all on seasonal timers so it’s never left on unnecessarily, and I’ve used energy-efficient LED lights throughout. Bathroom extractor fans and heated mirrors automatically switch off after 30 minutes. And because the property is now so well insulated, I took out the central heating, which we just don’t need any more Solar panels heat the water throughout the day, and I only need to set the gas boiler to come on for an hour in the morning to provide extra hot water for showering,” he says. Having spent the best part of two years creating the ideal home for his family, though, could he really bring himself to move out? “Well, I know I could double my money, so it is a bit of a temptation. But we absolutely love Forta Sante so I’d only do it if I could buy a similar-sized property here, and they are few and far between,” he says. In the meantime, he can ponder any possible future relocation and smart refit over a glass of wine on the terrace, listening to the lapping of the ocean (or his streaming music) in the lap of luxury. 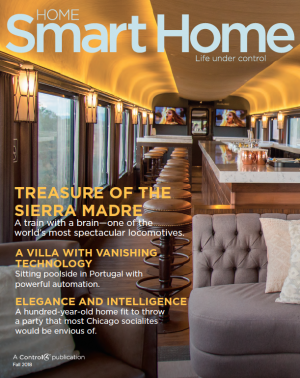 Want to learn more about smart home solutions? We'll send you more information.